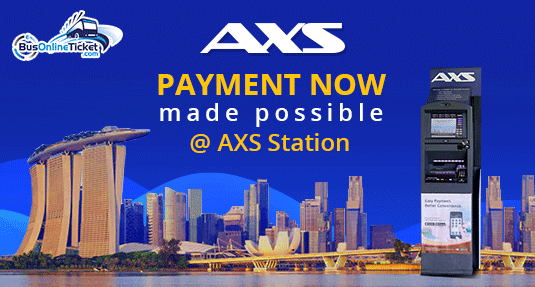 Home » Pay for Your Bus Tickets Booking at AXS Stations Island-wide! Pay for Your Bus Tickets Booking at AXS Stations Island-wide! BusOnlineTicket.com has offered a new payment option for bus tickets booking between Singapore and Malaysia. For those who are not able to pay online bus ticket booking with credit card are now able to pay at any AXS Stations with their debit card. With this payment option, everyone now can book your bus ticket online at BusOnlineTicket.com and visit any AXS Station to make the payment. AXS is a one-stop multi-application and interactive self-service terminal with access points more than 870 AXS Stations island-wide operating 24 hours daily. It is available in major shopping centres, petrol stations, convenient stores and neighbourhood town centres. This has brought much convenience to travellers that do not have credit card and would like to book their bus ticket online via debit card. Travellers now can book your bus ticket from Singapore to Kuala Lumpur, Singapore to Malacca, Singapore to Genting Highlands and many more at BusOnlineTicket.com and make your payment at AXS Stations. Customers can choose from many types of buses to suit their budgets and traveling needs, ranging from an 18-seat luxury bus with onboard entertainment to a standard 40-seat bus. Popular operators include Grassland, Transtar, KKKL and WTS Travel & Tours Pte Ltd and many more. Choose AXS as your payment option when you make online booking at BusOnlineTicket.com and then print the payment slip. Seats will be reserved for 24 hours, during which time you can make the payment at any nearest AXS Stations. Once the payment is made and approved, you will receive a receipt and an email confirmation for the booking. You are advised to keep the AXS receipt as proof of payment. For more details, see AXS Payment Guide.